Here short description of window sections. 1) Credentials of your account (if you are using normal Google Docs it will be your GMAIL address, if you are using Google Docs as a part of Google Apps for Domain it will be your address in Google Apps). 2) Checking of checkbox "Remember Password" will cause that OOo2GD will store your user login and password on your computer, thanks to this you will be able to use OOo2GD next time without providing those data. 4) Configuration button lets you to open Configuration window. 7) Operations section, you may Open document, Download it or open it with Browser [so download document by browser] or in Browser [in Google Docs]. Checkbox Autoupdate allows you to decide if you want to update document version in Google Docs after each save. 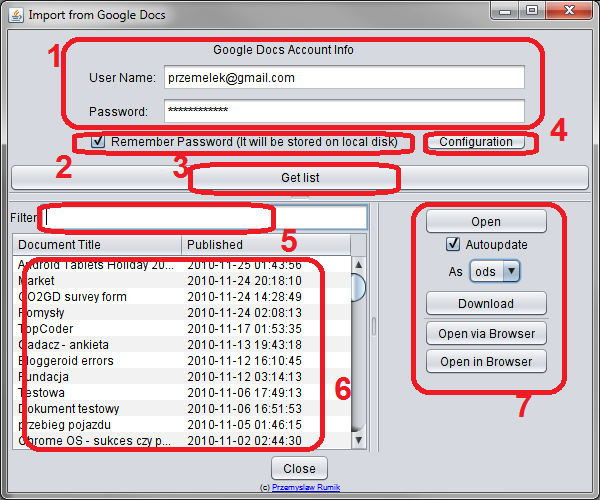 Listbox "As" shows available formats for downloading of given document. For text document those are "odt", "doc", "rtf" and "txt", for spreadsheets those are "ods", "xls" and "csv", for presentation it is only "ppt".